Kelsey Priest is a Portland, Oregon native and a third-year MD and PhD student in the School of Public Health and School of Medicine at Oregon Health & Science University (OHSU). She is in the doctoral phase of her training in the Health Systems & Policy program, where her research is focused on the variation of hospital-based care for people with opioid-use disorder. She plans to complete her residency in internal medicine with a fellowship in addiction medicine. 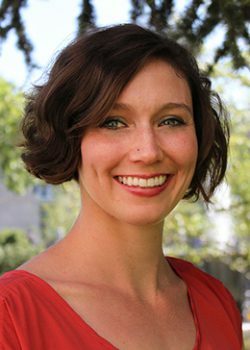 Over the last few months, Kelsey, under the mentorship of a seasoned physician activist, has become involved in helping organize and communicate to an online community of health professionals who are interested in action around local and national health justice-related issues. “With my previous training in public health, my approach in medical school has included a systems and population health perspective. During my doctorate, my interest and comprehension of health policies, systems and politics has expanded but my thirst for understanding has increased as I try to make sense of our volatile and tumultuous political climate, and the potentially catastrophic implications of dismantling the PPACA and the Medicaid program. Over the past few months, I’ve noticed that this volatility has led to an increase in activity and dialogue in the medical community and beyond around issues of sexism, racism, classism and identity. For me the recent election has accelerated an awakening around my privilege and various identities—including that of a physician-in-training. It has also pushed me to critically examine the inherent biases and oppressive forces within our institutions and systems, and wonder what it would look like to dismantle oppressive systems and to rebuild. I believe physicians have a role in rethinking and dismantling the system. But how do we get there? “As a start, I think we need to have more conversations around how the institutions are broken or inherently oppressive. We have to recognize and reconcile the tension between advocating inside and outside of a system we want to change. An example of these conversations is a peer-to-peer curriculum called structural competency. Structural competency framework developed by anthropology scholars for health care professionals to understand the relationships among race, class and symptoms, and to assess the institutional, political and economic forces that drive health inequities. The course was started at OHSU three years ago by medical school classmates in the class above me using this scholarly framework. The second-year medical students facilitate discussions with the first-year medical students on issues such as structural and institutional racism, homelessness and housing insecurity, substance use disorders and trauma-informed care. It is grounded in discussions around systemic oppression, classism and racism. The premise is to teach students about the upstream determinants of health and how these factors impact their patient who is sitting across from them in clinic. “A few other schools include structural competency in their medical school and residency curriculum; so the conversations about institutions and systems are happening. I imagine and hope because of the current political climate, as students become more and more activated, that we will see more of this type of curriculum across the country. Hopefully this perspective will percolate through the training levels, trainees become faculty, and then eventually we see a shift in culture and changing systems. But how does professionalism fit with advocacy and political action? The views, opinions and positions expressed by Kelsey are hers alone and do not necessarily reflect those of her institutions or programs.